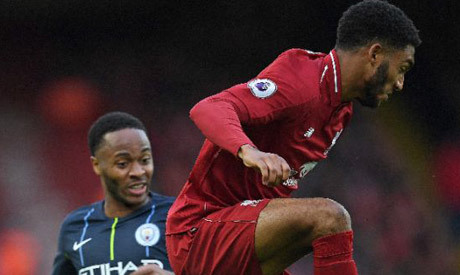 Liverpool have confirmed that defender Joe Gomez suffered a lower leg fracture during Wednesday's Premier League victory over Burnley and faces up to six weeks on the sidelines. The England defender, 21, was carried off midway through the first half at Turf Moor following a challenge with Ben Mee, with Liverpool going on to claim a 3-1 win. "Liverpool can confirm Joe Gomez sustained a fracture to the lower left leg during the 3-1 win at Burnley on Wednesday night," the club said in a statement on Thursday. "The defender needed to be substituted after 23 minutes at Turf Moor following a challenge from which he was unable to continue. "Gomez's injury was further assessed by the Reds' medical team at Melwood on Thursday. "Initial indications suggest the 21-year-old is facing a spell of up to six weeks out of action, though this is dependent on how his treatment and rehabilitation programmes progress." A six-week absence would keep Gomez out until mid-January, with Liverpool facing nine games between now and then in three different competitions.